Neville: "I think there would be uproar if he was allowed to leave Chelsea"; Carra: "If I was Hudson-Odoi, I wouldn't sign new deal"
Gary Neville and Jamie Carragher engaged in a passionate discussion about Callum Hudson-Odoi's Chelsea future - and whether young players get too much, too soon. Hudson-Odoi made only his second Premier League start against West Ham and has yet to commit to the Blues, with his contract due to expire next year. 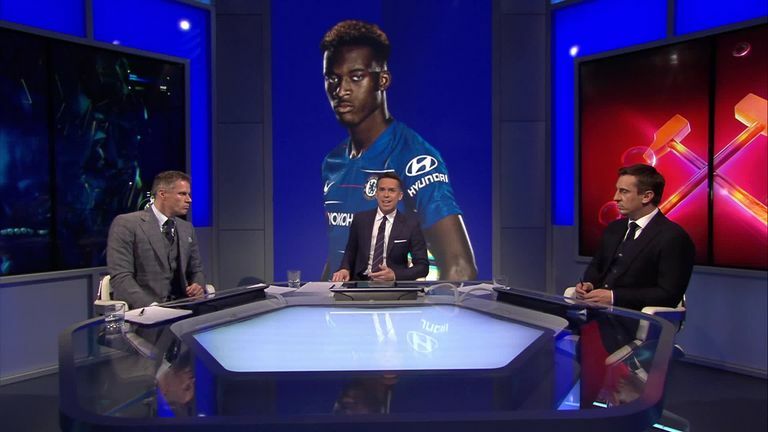 Speaking from the Monday Night Football studio, Neville called on Chelsea to finally "believe in their own", while Carragher praised Hudson-Odoi's "courage" in holding out for more playing time before penning a fresh deal. Gary Neville: "Hudson-Odoi's made a huge impression on me. He's a huge talent. He can beat a player, go outside, he plays on the left and right, physically he's got no problems. "I think there would be uproar if he was allowed to leave Chelsea Football Club without being given a chance. This feels like a crossroads moment for Chelsea in terms of their belief in a young player. "For me it's about giving him the opportunity, and Chelsea have failed so many times at that over the last five or six years, where players have gone and thrived elsewhere. This is the moment for them to believe in their own." Jamie Carragher: "If I was Hudson-Odoi I wouldn't sign [a new deal]. He's in a very strong position. I love the fact he hasn't signed a contract, not because of the money thing or because of Bayern Munich, but because he wants to play. There's a frustration there. I love the courage he's shown. He's willing to say, 'If I don't play, I want to go'. "I wouldn't be going at the end of the season if I was him. The situation Chelsea are in, I'd use the last year of my contract as leverage. I don't mean that in a disrespectful way, he'd be saying to Chelsea, 'Prove to me next season how important I am to you by playing me'. If I was Hudson-Odoi I wouldn't sign [a new deal]. He's in a very strong position... I love the courage he's shown. He's willing to say: 'If I don't play, I want to go'. "Chelsea want to give him a five-year deal because they're terrified he's going to leave for nothing, and as a business they're going to leave for nothing. I have great respect for what this lad is doing at the moment. "I don't think he should sign, I don't think he should leave, but I think he should see how many games he plays next season, and if he plays enough, sign a contract with your boyhood club, and if not, you move on." Neville: "He should be playing more. But having a distraction over you like your contract for 18 months, the questions over you in your most formative years, where you grow and learn the most, does he really want that in his life? "When young players have got distractions about money, contracts, it's not great for them. Just play football. Learn every day about football. Don't think about contracts and money, even though I respect the fact he has a character and personality to stand up to it. " Carragher: "I think clubs bully players into signing long contracts. Clubs do it to make sure they've got a re-sale value. "Brendan Rodgers came from Chelsea a few years before Liverpool; he'd seen this model in the youth set-up and reserves. He came up with a saying about young players, and it wasn't just about Chelsea but mainly them... 'We pay them to fail'. "He said the problem is that giving them that much money, the hunger is going, and then when they do move on they can't get out because they can't afford the wages. "So in some ways you end up with a (Ruben) Loftus-Cheek. I'm delighted Loftus-Cheek's playing against West Ham, but we still talk of him as a young player. He's 23! Hudson-Odoi does not want to become Loftus-Cheek. "Josh McEachran, Nathaniel Chalobah... so often it happens at Chelsea." Neville: "For me this is such a prehistoric view of coaches in this game, and pundits at times in this game, to say that we're 'Paying them to fail'. Get over it. You are going to be coaching players who are on big money. Fact. "So the idea of keeping them off big money until they're 22... those days are gone! "Coaches coming out saying, 'We're paying them to fail, we shouldn't be giving them this contract, or that contract...' No. Coaches now have to adapt." Carragher: "Are you saying that isn't a problem in football with young players? I'm not sitting here as an ex-player saying it's a disgrace. Good luck - earn what you want - but I'm talking about the hunger." Neville: "It is a bit of that. These players are worth £100m potentially, they're going to get big money from the age of 17 or 18, the clubs have to give them that money or else they'll leave. "We said 20 years ago there were lots of leaders in the game, characters, men and fighters. These lads have now actually got more about them than we had 20 years ago, so they will stand up to the clubs. They've got some guts and a little bit of courage, and to say, 'Hang on, if you're not going to play me I'm going to leave'. "(Jadon) Sancho did it to City. (Paul) Pogba did it at United. I admire it in a way. "Coaches saying they get too much too soon - that's not going to change! This is the modern day, so you have to coach differently, or adapt to that. I agree with you, life isn't like it was 20 years ago!" Chelsea vs West Ham LIVE! Carragher: "It doesn't sound like it, you just called me prehistoric!" Neville: "It's a prehistoric view!"